Clear, blue waters, white sand, and negligible waves make this beach a vacationist’s paradise. Here are my general, honest, and unbiased impressions on the famed beach. Easily the most famous of all beaches in Panglao Island, Alona Beach’s strongest point is its accessibility and convenience for the average tourist. Located in Tawala, Panglao, Alona beach derived its modern name from a Filipina actress, Alona Alegre, who had shot a film on this very beach. Since then, the name stuck and gained widespread popularity and it is still known as Alona Beach to this day. The water is clear up to about five to ten feet from the shore. The rest is a thick stretch of seaweed dotted with orange starfish and small fish and corals. The slope is gentle, and there are virtually no waves. The sand is generally white. A section in the middle has powdery sand that can rival Boracay’s, that if you put water, you will hardly feel any grains. The south side has rockier/clumpier sand and less-swimmable areas. The north side, beside the cliff, has the thickest stretch of beach for lounging and the longest stretch of seaweed-free water. The plethora of establishments compared to that of other beaches makes for an easier vacation. Hotels, resorts, restaurants, dive shops, bars, and trinket shops line the entire stretch of beach. The vibe resembles that of Boracay Station 2. There is a lot of entertainment to be had, including fire dancer shows, ukulele-weilding kids, and beach massages all hoping for your hefty tip. The only thing you will have cause to look for outside the beach is a source of cheaper food, but that is easily remedied by carinderias at the back roads. Boatmen and island-hopping canvassers will bug you non-stop, so you will never miss out on any tours they have to offer. My advice is to go straight to a boatman who owns a boat for more flexible, better prices, as canvassers get commissions from the boatmen. 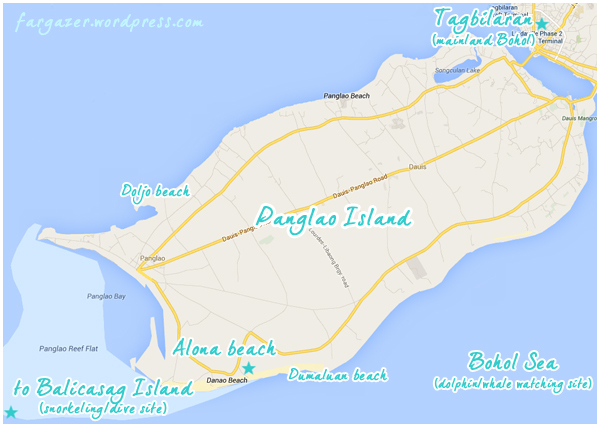 For more information on island-hopping in Panglao, visit my post here. Diving is also pretty affordable. A beginner’s fun dive will cost about Php 2,500 on a good bargain. Maybe less, for off-peak season. For certified divers, it is around Php 1,500. For the fact that Bohol Sea is a rich, calm, and diverse sea, it seems more worth it to me than, say, diving in Boracay. Or Oslob, which shares the same sea, but is more expensive at a standard Php3,500 per dive. Most dive shops are owned or operated by foreign divers, who generally give fair prices to those who want to explore diving or get their diver’s license. Fire-dancer native band leader from Mindanao, Paul. Too many boats docked along the beach, somewhat marring a picturesque horizon. Generally ridiculously overpriced food. It can be overcrowded on peak-season (Holy Week, Labor Day, Christmas-new year). Accommodation is on the expensive side even for the most basic of rooms. It can be hard to get in, out, or around the island for a fair price, and the option is mostly often habal-habal, which may be uncomfortable for some. From anywhere in Tagbilaran, I recommend a private chartered trip if traveling with a party of 2 or more as to avoid the hassle of waiting for other passengers, for the fastest, most direct route, and for comfort (remember, you have luggage). Flag down a tricycle, taxi, multicab, or habal-habal (motorcycle) to take you to your beach of choice in Panglao. Rates will vary for each vehicle type, with the habal-habal being the cheapest and most numerous. You are overpaying if you pay more than 200 Pesos. Fargazer’s choice: If coming from Bohol countryside tour, ask your driver to drop you off straight at Panglao on the same day, instead of staying a night in Tagbilaran. While your driver may ask you for a few additional bucks, you save on having to re-hire a vehicle the next day if you opt to stay in Tagbilaran (which most locals recommend you skip, anyway), and you will have more time at the beach. Yay!